Covered Garage Parking (unfortunately, we do not validate for garage parking at this time)There are additional paid and free parking lots nearby. We offer our beautiful new event space named "The Central "with seating for an event up to 100 people. The Central also has its own private bar and private entrance. We also have a smaller just as beautiful private room called "The Cork Room" that seats up to 14 people. We also offer a beautiful award winning patio that has a mesmerizing view of the city. For Inquiries please contact the restaurant at 816-423-2888. Off site catering & special events Please contact Lacey Barrett for details. Like paint to a blank canvas, The Jacobson, or "The J" for regulars, transformed a 4,000-square foot warehouse into a modern restaurant and bar in the heart of the Crossroads Arts District. A glance at The Jacobson's variety of contemporary American cuisine yields a collection for meat lovers, vegetarians and vegans. Much like an artist who draws inspiration from his or her own environment, diners in search of muse are encouraged to mix and match tastes when ordering appetizer & entrees from the Mingle & Center Stage sections of the menu. 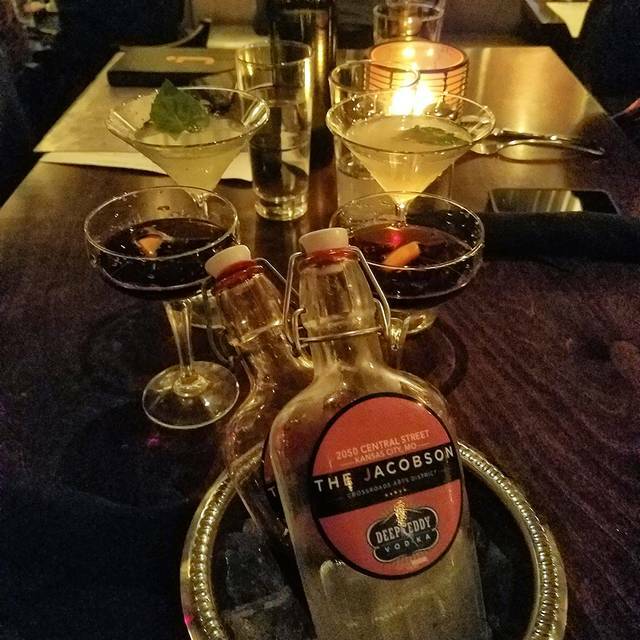 The Jacobson offers a seasonal, scratch kitchen, and boasts one of Kansas City's more progressive bar programs, including handmade craft and barrel-aged cocktails, and The Jacobson's original flask service. Special Mothers Day Brunch! Go to www.thejacobsonkc.com for more details. Ambiance and waitress was great. Salmon was under done and salad didn't have enough dressing. When we asked for more dressing from a separate waiter, we got a slightly dirty look like we were bothering the server with our request. Wonderful service. Great ambience. Music selection was great and the volume allowed conversation. They seem to always be out of items that they have on their menu such as the french dip. The serving staff is terrible. They need a full staff overhaul if they want to keep brunch clientele. 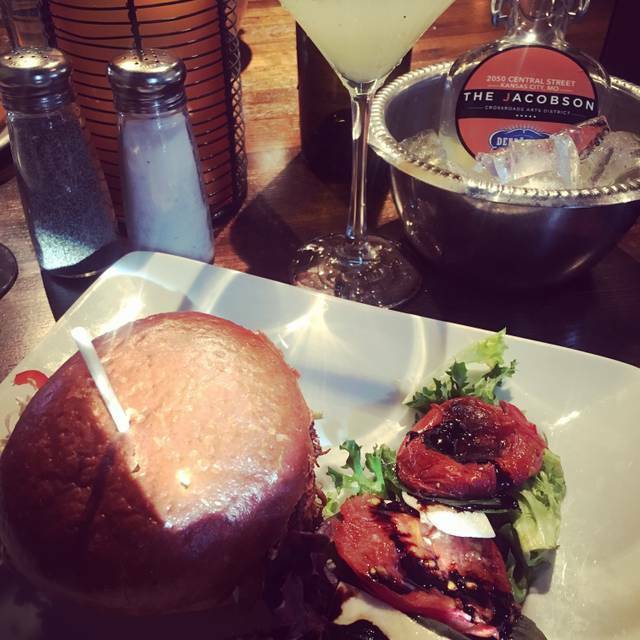 I have dined at The JACOBSON several times and have never been disappointed the food and service is always great! I would not recommend The Jacobson to anyone with their 30s in their rearview mirror. The place was SO LOUD, my friend some of it (the bread) was not even there. I could not tell if our server was tired or new; he was very slow. Staff was excellent, from the hostess to the waiter. Shrimp and Crab Dip is to die for. The table in front of us started getting too loud. ..we wanted to stay longer but they where doing the most today! Have been to the jacobson many times and always love our experience. This visit was kind of disappointing. Our service was poor. The appetizer was cold. Hopefully just a fluke. Would go back again. Once it got really busy the service got slow. Seems the wait staff was overwhelmed. It was a concert night so maybe they didn’t plan full staff like they should have. The bartender and wait staff are very unfriendly. The floor manager was amazingly outstanding. Please eat here if you love excellent food and a staff that make you feel like you don’t deserve to be there. The waiter had numerous issues. He did not know how to pour wine at all. Food was good as usual. We will be back as this is an isolated issue we are sure. The restaurant was virtually empty yet it took forever to get service. My champagne was flat (& not cold) and we had to ask multiple times for ice, additional silverware etc. And the big bummer was that the food was just kind of bland. The Brussels sprouts were hard (not cooked) in the middle and the steak hardly had much taste. The highlight however was the Dutch Baby dessert which was DIVINE. Everyone usually raves about the Jacobsen and i was so excited to try it. Unfortunately it didn’t wow me. We had a great meal and the service was really good. Look forward to return. Food and service is outstanding. You will not be disappointed. We had heard so much about The Jacobson and was expecting something really exceptional. It was my wife’s birthday and I wanted to treat her to something extra ordinary. First let me say that parking is atrocious. Valet parking is available but that costs. Overall The food was very good but super pricey. As an appetizer we had the “goat cheese stuffed meatballs” - nothing to get too excited about. My wife had “plank salmon” and I had “pan seared scallops” - both were very good. We also had the “Brussels sprouts” - tasted exceptional but did not set well in me or my wife. Service was outstanding. Our server was cordial and very helpful. Ambiance was nothing to get excited about and for the most part lighting is poor. This is the kind of place that might appeal to the younger crowd but not for the “mature” bunch. We will not be going back. Overall everything was great, except our waitress who was very pushy and came off very rude and offered us our checks several times before we were even ready to leave. I usually love coming here for brunch, but this lady’s attitude toward our table really turned us off. Granted, she was training someone but her attitude definitely killed the good vibe we had going. Would not recommend this restaurant. The coffee was cold and our standard American breakfast tasted like it was taken from a cold buffet line. Service was poor. Was essentially abandoned by the server. The restaurant was one of my favorites for quite awhile then seem to fall off. We decided to give it another chance and it was good. The grilled oysters could use a little more flavor but the steak with the Jacobson touch was delicious. You should try. Food was just OK. Server acted like he didn't want to be at work, and wasn't friendly what so ever. Talked bad about the hostess to us because she didn't give us the happy hour menu. Lights were so dark you can hardly read the menu or see to eat. Would like to maybe return in the summer to visit the patio scene. 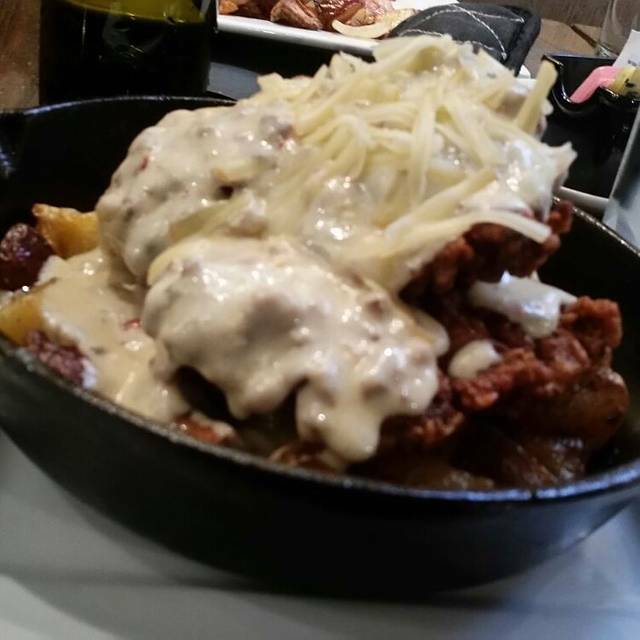 Had the baked brie, truffle fries, and stuffed meatballs. 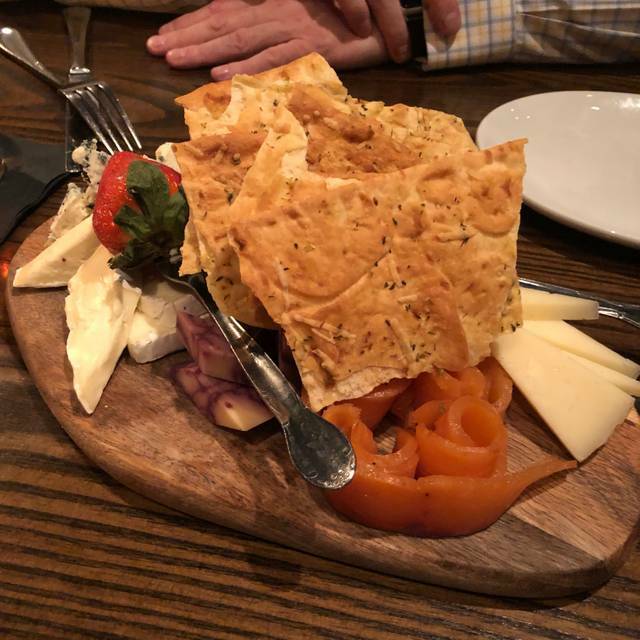 All appetizers weren't anything to rave about. Food was delicious! Parking is horrible downtown. 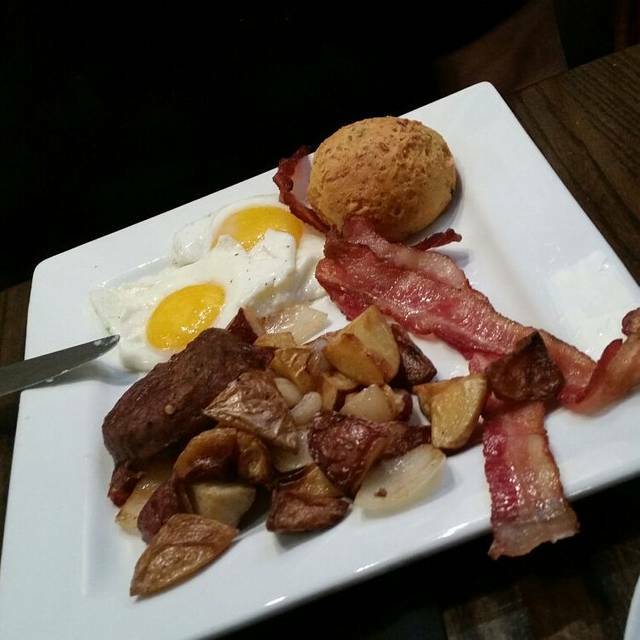 We went on Sunday during brunch; would like to go back to have something off their regular menu. I was very disappointed in my experience today at the Jacobson. I have been here before with outstanding service, so today had me really surprised. When we first got there, it took awhile before our server to even approach our table. Once we ordered drinks, half of them were wrong, which appeared to set the tone for the whole experience. Our server took our order, which he had to come back and confirm a while after taking it because he was derailed, never put it in and forget exactly what it was. Then, when our food came out, one of the ordered was incorrect (bacon came out instead of potatoes) and it took over 15 minutes to have the correct side order to our table. Also, every time I needed a refill on my bottomless mimosas I had to ask for it. The last time, I received a rude response as if I was an inconvenience to our server. Not that I was asking for anything over the top as I believe my glass was only refilled 3 times in the hour and half we were there. We also asked for refills on water that was never brought to our table. It was the opposite of what I was classify as an enjoyable Sunday brunch with my girlfriends. 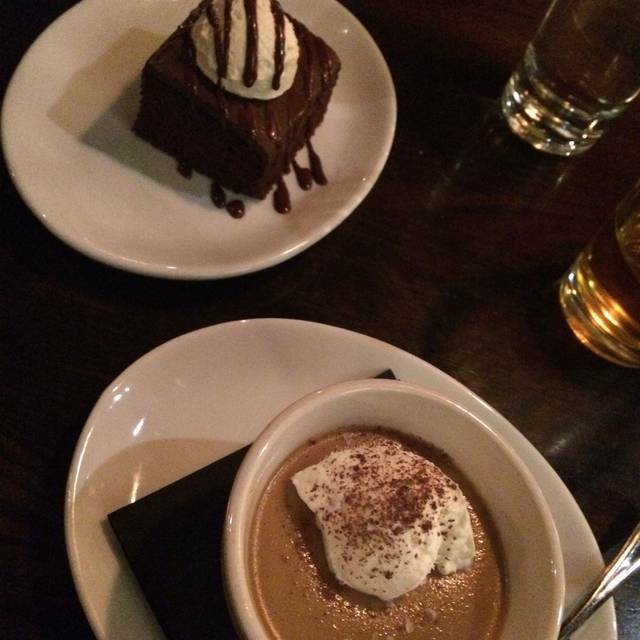 Awesome place, great food and drinks, definitely the perfect place for a date night! Their shrimp and crab dip was freaking amazing! Dining room was extremely dark; numerous people - including my wife and me - had to use the light on their cell phones in order to read the menu. Wide selection of appetizers/small plates; crab dip was excellent. Entree selection was rather limited. Noise level was high, accentuated by repeated F-bombs by the man at the next table. Overall, not the experience that my wife and I were hoping for. The food at the Jacobson was amazing! We had an awesome waiter too. Great atmosphere. Server was attentive but you could tell he did not approve of our company. Great food overall. 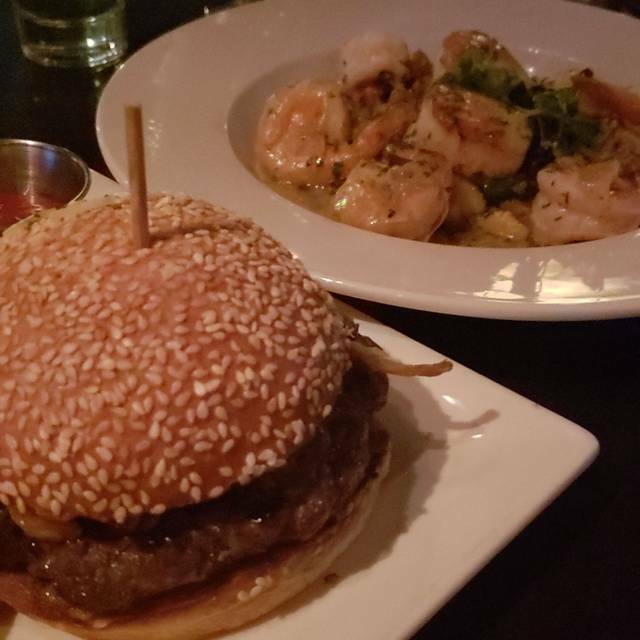 Food was excellent, the service was amazing! Loved the bottomless mimosas! A girls night out! Unique drinks and good food. The waiter hyped up the flavors of the food, which when they actually arrived were underwhelming. When the waiter was describing everything he actually mentioned DO NOT order a specific dish - nobody likes it. It was the first time any of us had actually heard a waiter say something like that. There are far too many other restaurants in this town with much better food. We got there at 5pm when they weren't busy and the service was slow and as they got busier the service got even slower. Nothing impressive about this restaurant unfortunately. Very good food, excellent service. Only issue was the 70's style disco light above our table which was weird and somewhat annoying. Lighting was so poor that we actually had to use waiters cell phone to read menu. All in all, positive experience and would easily not hesitate to recommend. It's not cheap... but you get quality food. The food was incredible. Possibly best truffle fries I have had so far. The crab dip was also delicious. My griflriend’s Mac and cheese tasted good, but seemed to a tad bit warm for possibly sitting a bit. The service was poor at best for majority of the night. Our waiter never told us the special for the night (Valentine’s Day) but told every table around us. Water took about 20 minutes to be refilled and we rarely we checked on compared to other tables. Our food took almost 40 minutes for our main entrees which were Mac and cheese in a skillet and a seafood stew type of dish. We arrived at 6:30 long before the large rush of people came in around 7:15ish. Our waiter also seemed to have forgotten our order when it stopped by letting us know our chicken was taking a bit of time and would be our next even though we had never ordered the chicken. It wasn’t until our entrees came out that the service significantly improved, so we appreciated the effort to makeup for the night. The ambience was also very dark and the lighting was not helpful to read the menu. I also wish the lighting was better so I could see the delicious food I was eating. Overall, I would only come back for the food if I could serve myself or for takeout. The food seriously was the only thing that kept me in the building to finish my food. I would not recommend this place to dine at night, especially on holidays. Went there for Valentines Day was not shown the Valentines Day menu and there was never any mention of it. The only reason we found out about it was the table next to us who had the same waiter was telling them about it as soon as they sat down. Our waiter was terrible, we ordered another round of drinks halfway through dinner and they never showed up and had to tell them we didn't want them anymore. The Food was good but it doesn't make up for having bad service. Will not be going back. Very interesting menu items. I think most menu items are dishes I’d love to try in future visits. I will go back.